I’m always looking for ways to make my life easier. If there are time saving steps for anything I do, I would love to find them. I love using my crockpot. It is my favorite way to make dinner for my family these days. I love chili. Everyone in my family eats it well, and it’s one of those one-bowl meals, which also means less clean up. Can’t go wrong with that, right? All the crockpot recipes I found required cooking the beef first. That didn’t sound like something I wanted to do. What’s the point of making it in the crockpot if I have to cook it and use another pan first? Then, I had an idea. 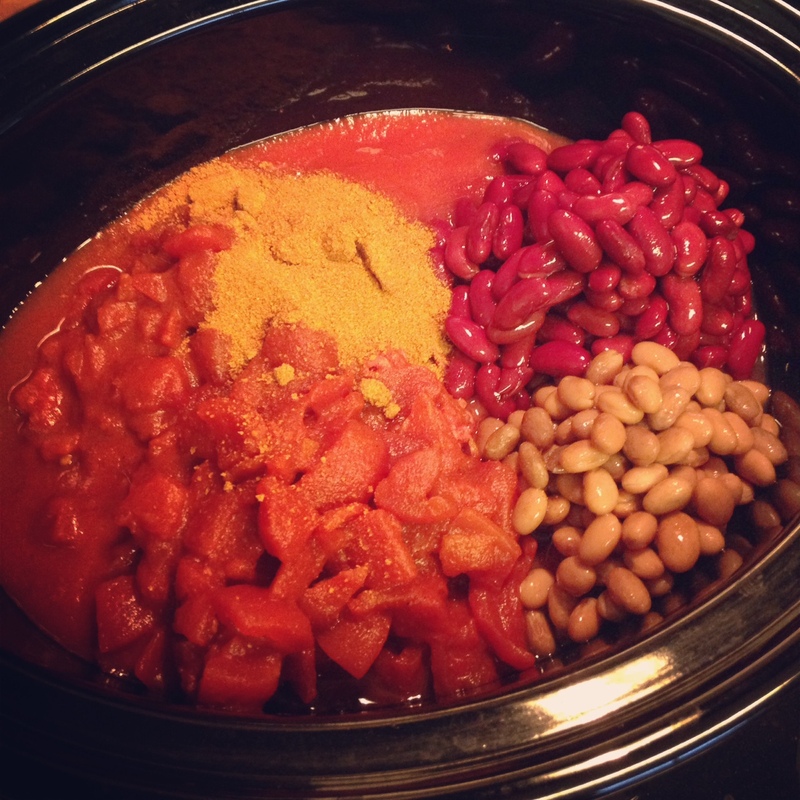 What if I put the meat in the crockpot without cooking it first? How would that turn out? There was only one way to find out. I tried it! I posted on Facebook, asking if anyone had tried doing this before. No one had. Here are my ingredients. Everything was in a can, which some may or may not like. 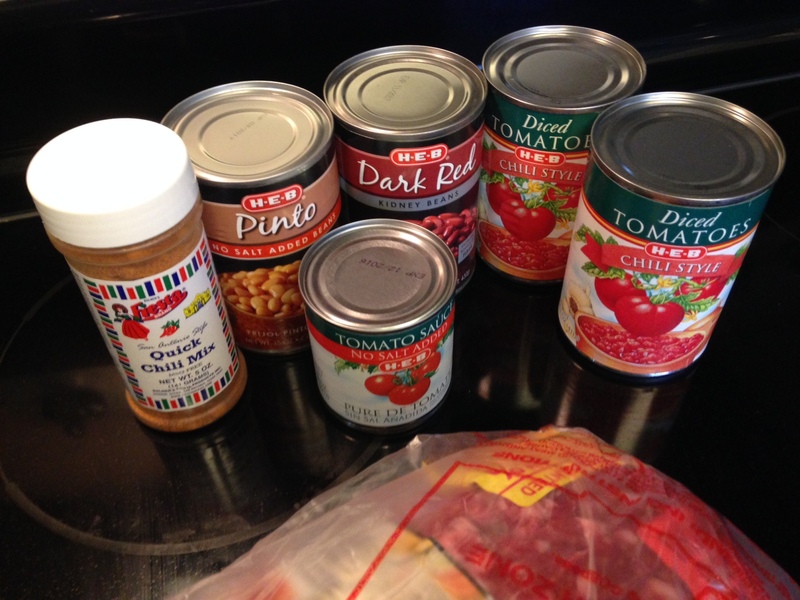 I try to use fresh when possible, but I’m okay with canned tomatoes and beans, too. I threw everything in the crockpot, starting with the meat. I figured it would help it cook faster if it was at the bottom. Then I just dumped the tomatoes, sauce, beans, and seasoning. I didn’t stir. I set it on HIGH. An hour later, I peeked at my chili. I took a spoon to see what the meat looked like. To my surprise, it was brown! I’m not sure if it was completely done for sure, but it looked like it was close if not already. So, I gave everything a quick stir, breaking up pieces of beef as I stirred. I didn’t see pink in the meat at all. Score! I forgot to take a pic of the chili right before we ate it. This is what was left of it. Ian likes chili with cilantro and green onion. (I know, weird.) Here’s his bowl. The chili was kid and husband approved. Ian only suggested that I use more of the seasoning next time. 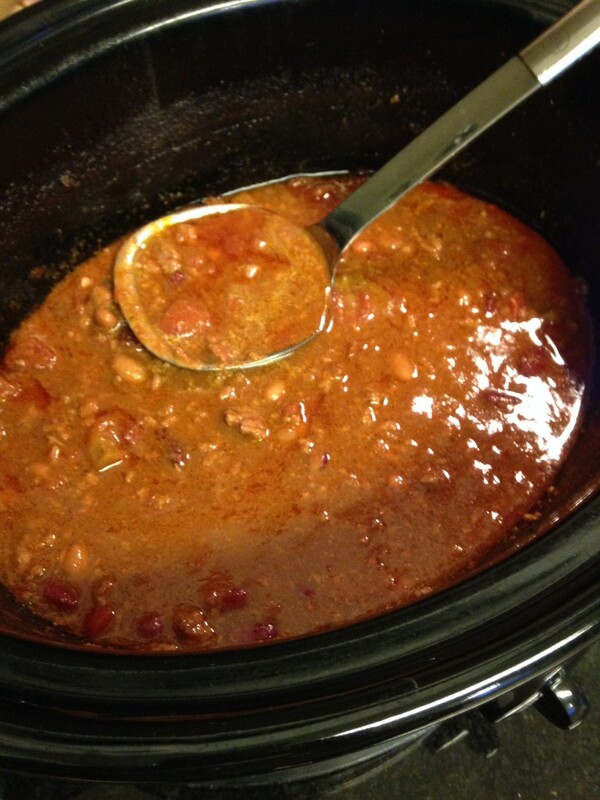 And our tummies are just fine today, which means the chili was completely done. 1. Throw everything in a crockpot, starting with the meat at the bottom. 2. Cook on HIGH for four hours. STIR and break up meat after ONE hour. ***If you are home, give it a stir every once in a while to make sure it’s cooking evenly. You’re welcome! 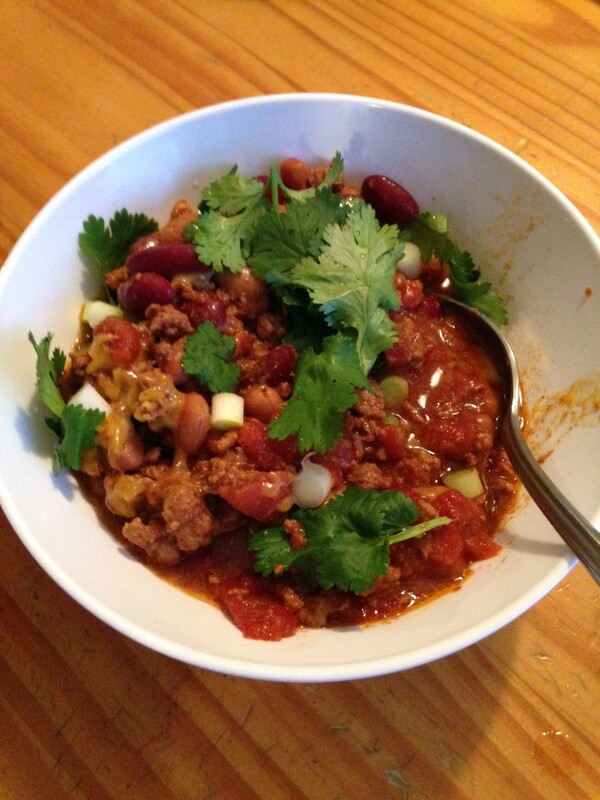 Now you know you can make chili without cooking the meat first! One less pan to wash! That is so good to know!! Anything that makes ones less dish to wash is a winner!! Yes, Wendy! Clean up was easy! Just the crockpot insert, bowls, and spoons! You can’t beat that!